Membership in the Industry Studies Association is open to academics from every discipline, researchers in government agencies and non-profit organizations, and other persons who are supportive of the Association’s mission, which is to advance industry studies scholarship. Members find value and share common interest in research that demonstrates significant personal investment in developing an understanding of the markets, firms, and institutions that characterize particular industries. The key to participation is shared commitment to a research approach that places great value on direct contact with industry practitioners for insights, data, and observations at the firm, plant, or establishment level. Supporting Membership category is open to any individual who qualifies for membership based on the criteria above. The Supporting Member category provides the same benefits as the Member category, but it is intended for those who wish to provide additional support to the Industry Studies Association. 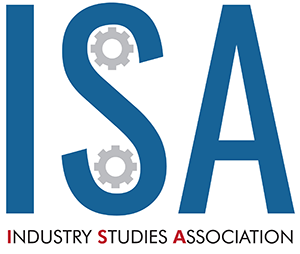 Graduate students in doctoral programs are welcome to join the Industry Studies Association as non-voting members. Any member of the Industry Studies Association who donated $500 or more to the Association on or before June 30, 2011 was entitled to special status as a Founding Member. The member's gift, which was tax deductible, was over and above any dues required for continued membership. Status as a Founding Member continues as long as the member remains active in the Industry Studies Association. Click here to view the list of Founding Members. To become a member or renew your current membership, click here.